Poll: Was Kam Chancellor right to holdout? You can follow ECU Pirate Cannon on Twitter @ECUPirateCannon and read his monthly feature at eastcarolina.247sports.com. We’re three games into the season and have a 1-2 record. We just suffered our first conference loss (albeit in the other division) in a triple option drubbing at the hands of Navy and we still have quite the out of conference schedule ahead of us as we host your Hokies and travel to Provo to take on BYU in 2 of our next 3 games. I like what I see out of our QB Blake Kemp who stepped up when our named starter went down with a season ending knee injury 10 days before our first game. He’s a good leader who isn’t rattled easily. Early on he may have been a bit cautious with the ball, but he’s settled in nicely and can be credited as part of the reason we had a chance at taking down the Gators in the Swamp. Two offensive juggernauts of this team that you cannot ignore are WR Isaiah Jones and TE Rob Gronk… err… Bryce Williams. Honestly, I’m not sure I have a perfect bead on our RB game yet. That aspect of our game needs to show me more against mightier foes to get me feeling more comfortable. Our once great rushing D struggled a bit against Towson (a better team than their previous year’s results may have you believe) and clearly Navy. The defensive backfield might look okay on paper… eh, we’ll just leave it at that. BUT, when the Pirate defense is clicking, as they were a good bit against Florida, they’re a huge asset. Overall, I’m cautiously optimistic. I’ve seen most of the pieces necessary to be a good team, now let’s put them together in one game… preferably by, say, this Saturday’s matchup. I expect to win. And no disrespect to Virginia Tech, but I always expect to win. This should be a sold out game as Pirate Nation will be in full force for the 3:30 bout against a fellow P6 foe (see what I did there?) being broadcast on ABC. The energy at kickoff will be electric – your first time visitors to Dowdy-Ficklen should be impressed by our game day atmosphere. On the defensive side of things, I need our rushing D to step it up. On offense, I’d like us to establish an effective run game again and see a ~60/~40 split by air and by land. What are your thoughts on the VT-ECU series? I imagine some of you think that playing ECU is a no win situation, and I’ll never convince that group differently, but I love playing the Hokies. It is my favorite out of state, OOC series that we engage in (true, I might not have a lot to choose from, but I’m considering the likes of WVU and South Carolina, and at this time I can’t think of a replacement I’d like better). Your program is top notch in my book and your fans and game day experience are pretty awesome. In our circles, we use you as the example of what we aim to be. “Give us the chance with the big boys, and we will compete. We can be the next Virginia Tech.” Also, if I can get a bit sappy for a second, one of my favorite moments was our game against y’all in Blacksburg after the shooting. The show of solidarity and appreciation between the universities prior to kickoff was touching. Oh! You also have a nice cannon too (even if you don’t allow him inside your stadium). As a Hokie fan, you may have read what I had to say and you may have seen highlights of our previous games this year and think, this game doesn’t scare you. But your team and fan base are smart enough to not overlook a scrappy ECU team. A pissed of ECU team + a sound opponent (we love playing up to competition) + a fan base (at home) that needs a solid win = a recipe for Pirate success. My money is staying in my pocket this week, but my heart says we play inspired ball and win by 7 in a competitive game on both sides of the ball. 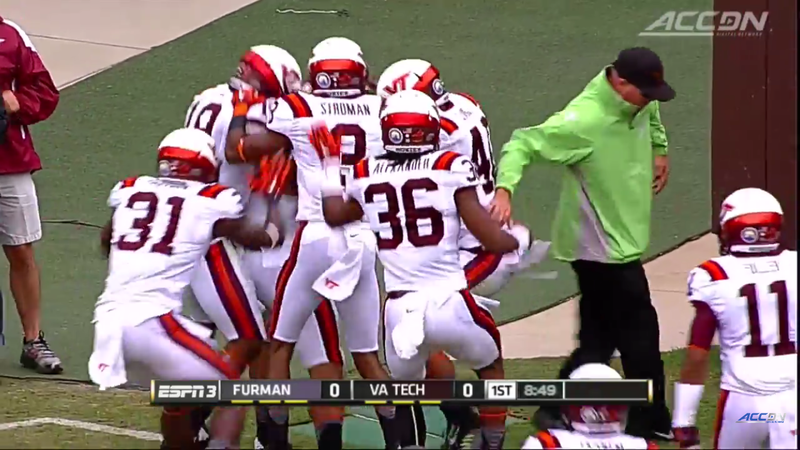 Call it ECU 28 – Virginia Tech 21. #BOOM!